Our knowledge is powered by 17 patents and over 32 years of experience designing and producing the best spa support products in the hot tub industry. NOTE: Other colors can be made available with a minimum order. WE'VE TURNED THE SPA INTO A RELAXING THERAPEUTIC EXPERIENCE! There's nothing on the market like the Aquassage™. 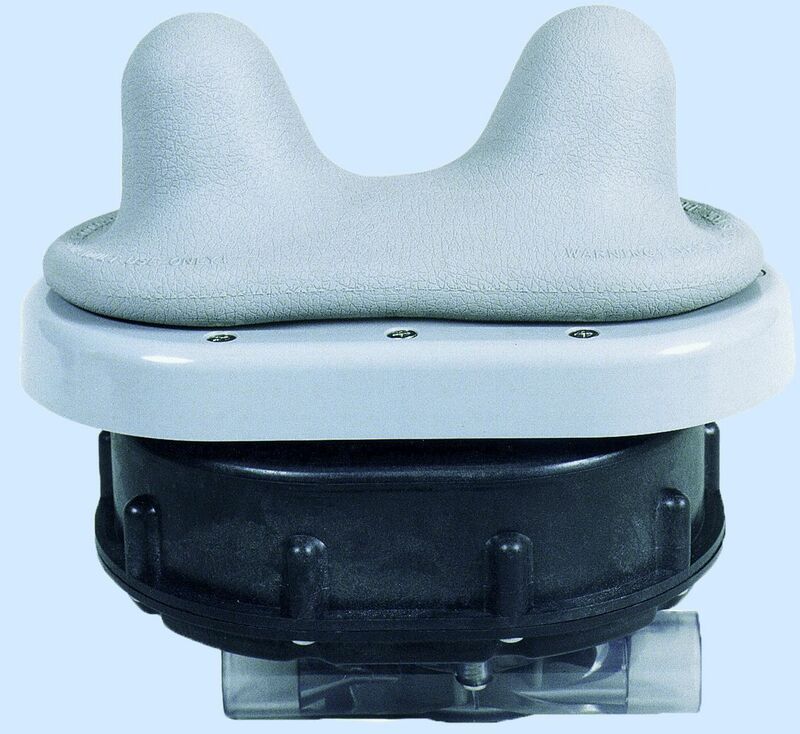 No other massager provides a soothing, comfortable massage to the neck and upper shoulder muscles like the Aquassage™. The Aquassage™ is the world's only non-electric massager to provide a shiatsu style massage to spa and hot tub users. That's because our turbine-driven Aquassage™ provides a slow, undulating massage on the neck and shoulders, without water splashing all over. Dr. Paul E. Wakim, D.O., an orthopedic surgeon in California, has evaluated the Aquassage™, and determined it is perfectly safe for use by adults in spas and hot tubs. WE'VE MADE IT SAFE, ENJOYABLE AND EASY TO INSTALL! It takes less than 10 minutes to install an Aquassage™, and it comes with complete instructions. Many spa manufacturers and spa distributors in the last decade have incorporated the Aquassage™ in their spas. Spa manufacturers such as: Bullfrog Spas, Country Leisure Spas, D. M. Industries, Diamonte Spas/Sensation Spas, Dimension One Spas, Dolphin Spas, Hydromax, Islander Spas, Life Spas, Lifespring Spas, Orozco International Spas, Pacific Fiberglass, Phoenix Spas, Platinum Spas, Regal Spas, Sequoia Spas, ThermoSpas, US Tooling Spas, VitaSpas, and many others. We have supplied thousands of Aquassage for hot tubs made by Bullfrog Spas. We have supplied thousands of Aquassage for hot tubs made by Country Leisure Spas. We have supplied thousands of Aquassage for hot tubs made by D. M. Industries. We have supplied thousands of Aquassage for hot tubs made by Diamonte Spas/Sensation Spas. We have supplied thousands of Aquassage for hot tubs made by Dimension One Spas. We have supplied thousands of Aquassage for hot tubs made by Dolphin Spas. We have supplied thousands of Aquassage for hot tubs made by Hydromax. We have supplied thousands of Aquassage for hot tubs made by Islander Spas. We have supplied thousands of Aquassage for hot tubs made by Life Spas. We have supplied thousands of Aquassage for hot tubs made by Lifespring Spas. We have supplied thousands of Aquassage for hot tubs made by Orozco International Spas. We have supplied thousands of Aquassage for hot tubs made by Pacific Fiberglass. We have supplied thousands of Aquassage for hot tubs made by Phoenix Spas. We have supplied thousands of Aquassage for hot tubs made by Platinum Spas. We have supplied thousands of Aquassage for hot tubs made by Regal Spas. We have supplied thousands of Aquassage for hot tubs made by Sequoia Spas. We have supplied thousands of Aquassage for hot tubs made by ThermoSpas. We have supplied thousands of Aquassage for hot tubs made by US Tooling Spas. We have supplied thousands of Aquassage for hot tubs made by VitaSpas.